Washington, May 28, 2018: EcoSikh, an environmental organization based in Washington, is planning to engage the Sikh community to plant 1 million trees throughout the planet to mark the 550th birth-anniversary of Guru Nanak, the founder of Sikhism. The organization’s goal is to reach out to Sikhs all across the globe to plant 550 trees at 1,820 locations in different parts of the world or in Punjab, as a gift to the entire planet. EcoSikh will initiate this plantation drive at a select location related to Guru Nanak in Punjab, India and in Punjab, Pakistan. “Guru Nanak always spoke on the issues affecting the common people and he raised his concerns against social injustices and discriminatory practices. Guru Nanak would have raised his voice against the current degradation of the environment, especially what is happening in South Asia and in Punjab. Guru Nanak said “pavan guru paani pitha, maata dharath mahat”, which means “Air is the teacher, water is the father, earth is the mother”. He wanted his followers to have a harmonious relationship with these gifts of nature”, said Dr. Singh. Supreet Kaur, EcoSikh India President, said “The 550th anniversary of Guru Nanak is an occasion which would excite a lot of young people to take meaningful action like planting trees in celebration. 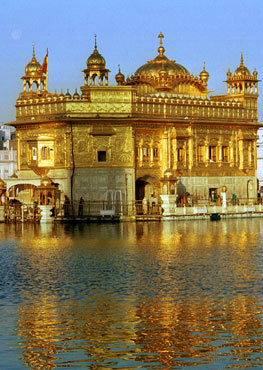 This would be the best way for them to relate to the teachings of Guru Nanak and to make other people’s lives better. EcoSikh has formed a network of young volunteers all across Punjab who will be engaged with grassroots to do plantation in different parts of the state and other parts of India. 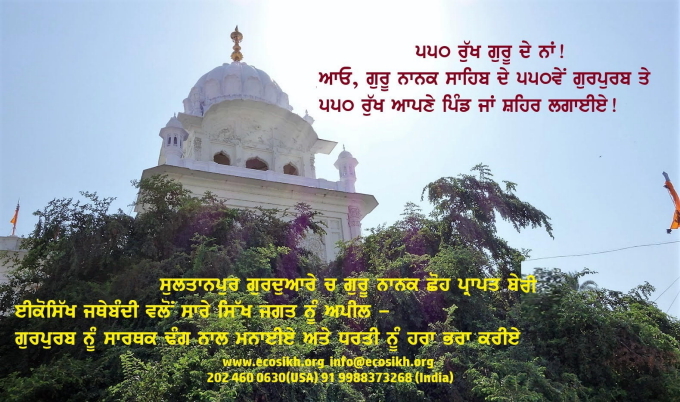 EcoSikh will also invite members of the Punjabi diaspora to sponsor or facilitate plantations in Punjabi villages during this celebrations of Guru Nanak's Gurpurab. There are over 125000 villages in the state. The EcoSikh team in Washington has already helped in planting 475 trees in the Chesapeake Bay near Baltimore in USA. In the last monsoon season, EcoSikh was able to coordinate the plantation of over 3,000 trees in various parts of Punjab, not including 2,800 trees planted in Amritsar alone in the last 5 years. EcoSikh plans to launch a special website for people to register all over the world for this task and it would encourage Sikhs to work with their respective governments and local administrations to work out a plan. EcoSikh will also collaborate with other international environmental organizations and the United Nations on this initiative.